A CSA (Community Supported Agriculture) share is a seasonal contract between us, the farmers, and you, the shareholders. This allows you to be a part of a farm community, not just a customer. By purchasing a “share” in the farm at the beginning of the season, members join in the risks of farming and reap its benefits throughout the year. Farmers and CSA members get to know one another and share in a close relationship with the land. CSA is also a great way to enjoy diverse, healthy, seasonal eating! Your investment helps pay for the seeds, soil amendments, tools, infrastructure and labor for the farming season. WHEN? : The CSA season runs approximately 16-18 weeks, typically beginning around mid-June and extending into October — at Mother Nature’s discretion. In addition to each weekly box of produce members receive a newsletter of farm news, recipes and cooking tips with each delivery via e-mail. HOW MUCH? : A full share feeds 2 veggie-lovin’ adults or a family of 4 mixed-diet eaters. If you are a household of only one, or two light vegetable consumers, consider splitting the share with a neighbor, co-worker, or friend. The produce will vary throughout the season, but each delivery will contain at least 5-10 different items. We aim to provide you with as full a box as possible. June 10, 6+ lbs: broccoli raab; radish; bok choy; kale; green onions, salad mix. 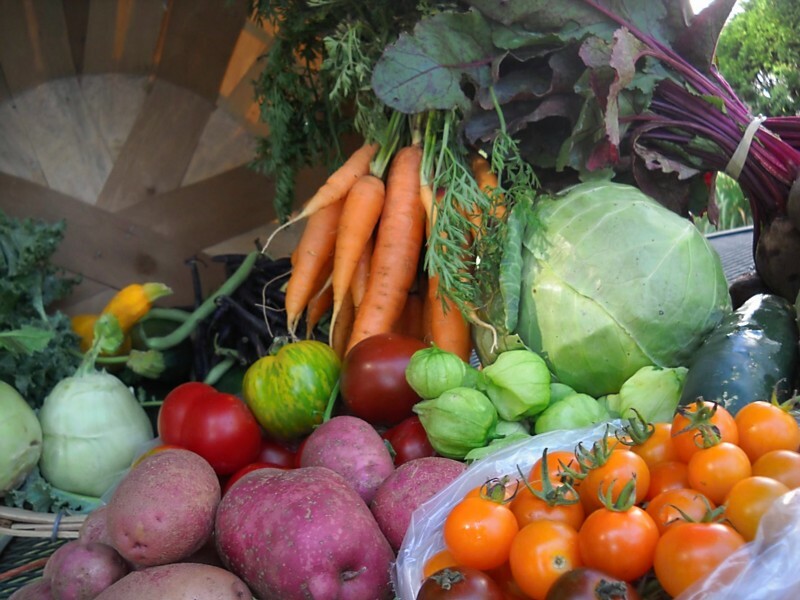 August 31, 35-40 lb basket: basil & tarragon; beans; carrots; chard or kale; cucumbers; edamame; kohlrabi; melon (cantaloupe or honeydew AND Sugar Baby watermelon); napa cabbage; red peppers; Yukon Gold OR Norland Red potatoes; tomatoes = Sun Gold cherry, Chocolate Cherry, Stupice, Black Knight, Green Zebra, Brandywine, San Marzano Italian, Yellow Sweets; Summer Squash; Winter Squash: buttercup and acorn; Zucchini. Extras: Anytime there is produce you do not consume, we welcome you to return it to us, as we can share it with the chickens or compost it into more black gold! 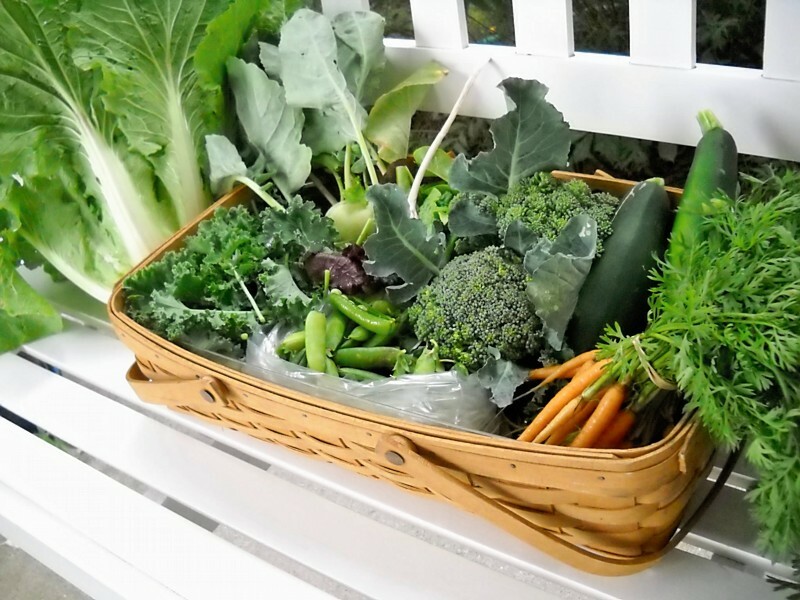 Fill-a-basket pick-ups at the farm will be on a mid-week afternoon/evening. The following week when you pick up you simply bring last weeks box/basket back and pick up a new box of fresh delivered produce from the farm. You also will be invited to a variety of opportunities to visit the farm throughout the season such as tour days, pot lucks, work bees, u-pick days, and a scarecrow building party which will all be on the agenda for this season. A week’s worth of available vegetables for 16-18 weeks. .
Notifying the farm at least one day in advance if a pick-up will be missed. As a farmer running the farm by myself, I rely heavily on help from you, as the investors and partners in what we do here. In order for the farm to remain viable and sustainable for me, we need to work together to create a farm in true community-supported spirit and actions. I encourage you to spend some time helping out with our community farm. If you would like to do a little farm work, I could always use a little help with some of the chores. Compensation for helping out includes some extra veggies, good company, ice tea, lunch, and wonderful sunshine. I plan on having workbees on occasional Saturdays. I am also looking for folks who would be willing to take on small jobs that they could attend to on a regular basis on their own schedule (love to weed? prune? tie up tomatoes? harvest?). If you have a morning or afternoon at any time, and you would like to come and help, let me know and I will schedule some important task for you. I can also use help in spring/May for bed prep and transplanting into the fields, when I am in my planting frenzy.